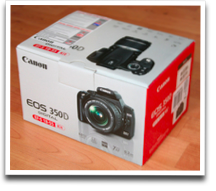 Today, the UPS courier brought a large box, containing my all new Canon EOS 350D. I only ordered it Wednesday from TopVision in Luxembourg, got the confirmation yesterday and today it was already in the Netherlands. Mwuhahaha! Fear, for I have a camera! Since the camera is delivered without flash memory, I was orienting about what cards are fast enough for the 8 Mpixel images (a side-by-side test of many cards). Of course, the top items – mainly SanDisk Ultra II and Extreme III, followed by cards of Lexar – can’t be found anywhere on such short notice. So, I got a plain and simple Dane-Elec card from BCC and was prepared for a slow shooting… That became a positive disappointment, storing a full-size fine JPEG costs less than a second. I guess the speed differences between cards become more apparant when shooting RAW format. Okay, so no need to spend loads of cash on flashcards. This Sunday is Harleyday in Breda and it will be the vuurdoop, I hope I will get some nice shots (and nice weather, too).